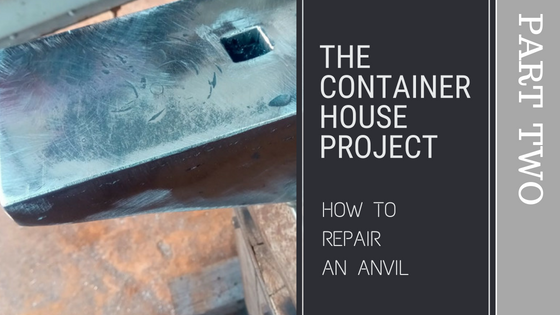 As you likely know, Kevin spent quite a lot of time making the new heel for his old, damaged anvil and spent even more time making the hardy hole for this anvil repair. Now all that was left was to assemble all the pieces to turn the broken chunk of steel into a working anvil that he can use to sharpen (is this a pun?) his blacksmith skills to the point of being able to make us awesome fittings for our container house project. At this stage, Kevin had three pieces: The remains of the old anvil, the new heel that he painstakingly made, and a new plate to attach to the top face. The second-last step, was to very carefully (leaving no air spaces), weld the the heel onto the anvil, and then weld on the new top face. He mig welded the parts together using his 3-phase welder. The top face also originally had a round hole, which he quickly sorted out with a blow torch and his hardened square bar. Fun Fact: In order to weld large pieces of metal together, as in this case, you need to heat up your work piece before welding in order to not stress the metal. If you do not, you run the risk of developing cracks due to the extreme differences in temperature between the weld and the piece you are working on. It needs to be “blue” hot; hotter than your stove top, but much cooler than the glowing red Kevin achieved using the forge. He used a blow torch to achieve this. Here is the anvil after all the welding was completed. Kevin then used a grinding disk to smooth out the welds and other surfaces. A bit of grinding makes all the difference. And now to answer the question no-one is asking… Can Kevin use his heated anvil and the forge to make himself a tasty breakfast? Very nice anvil. Can we have one about the tadpoles now?